Hails from I was born in Chamblee but grew up in the suburbs of L.A. Neighborhood East Atlanta Village. I love that it’s still got some grittiness. Local cravings I dream about the fried chicken and the scallion pancake from Gaja. Last thing you bought A greeting card from the Merchant. I go there once a week to add to my collection of cards. Spectacles Warby Parker. I’m a big fan of their business model, keeping the frames inexpensive but still cool. Go-to drink Night on Ponce from Three Taverns Brewery. I worked there for two years and was actually the second hire; my uncle owns it. How you get inspired Drinking coffee and looking at Pinterest and blogs like A Cup of Jo, Swissmiss, and Cool Material. Where you shop Chrome Yellow Trading Company is so beautifully done. I go there for Ace & Jig, Hackwith Design House, and Another Feather jewelry. And Stumptown coffee. Thanksgiving tradition My sister and I throw a “friendsgiving” every year. Everyone brings a dish; we provide the turkey. There are games. We put a lot of thought into table decor and nameplates. Spear takes all of her pics on her iPhone using editing app VSCO. 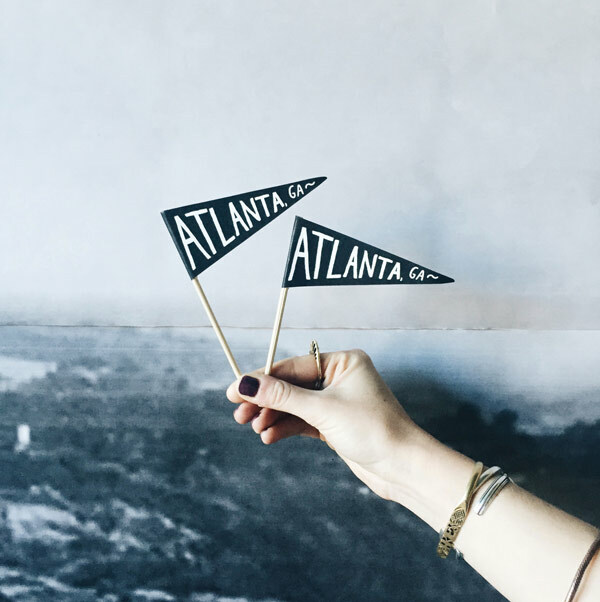 Some of her favorite Atlanta feeds: @brother_moto and @kafurniture.